Audiophiles love system tweaks. They are an essential part of the hobby. Get a playback system sounding just the way you like and pretty soon there’s nothing left to do but listen to music. Granted, that’s what the system is for, so there’s nothing wrong with that! But you know what’s even more fun than listening to music on a system that you like and know very well? Rediscovering your music collection after a subtle improvement to said system. Welcome to the audiophile’s hobby! Now there are a number of ways to approach tweaking that vary widely in cost. Often the best tweaks are free; for example, fine tuning loudspeaker location by shifting them a few more inches away from a wall or adjusting toe-in to maximize soundstage size while maintaining a sharply focused center-fill. Almost endless fun, but eventually you’ll get things dialed in pretty well. From there, you could consider upgrading components, but that’s an expensive way to get your system tweak fix. Fortunately, the industry has responded to the tweaker’s itch with a nearly endless variety of products that promise to enhance our listening experience at a fraction of the cost of a typical high-end component. These range from standard fare like power filtering electrical outlets, isolation platforms, and shielded cables to the rather bizarre, like magic stones, discs, resonators, harmonizers, transducers, and pendulums that claim to do stuff like channel subtle energy within the human brain aura. I have no idea, but I try not to knock something until I’ve tried it even if I don’t understand how it works or even could work. Careful though. There is something called placebo effect; applied to this hobby, it’s essentially convincing ourselves that a system sounds different when the actual output has not changed. Listening intently to detect the impact of a change can have a very real effect on how we perceive and process what we’re hearing. Did that new power cable actually improve macro-dynamics, or are we just paying more attention to the percussion solo? Who knows, and to some extent, who cares? If that garden hose sized kevlar wrapped power cable inspires us to pay more attention to our music and enjoy it more as a result, it may be worth the cost–even if the effect is not lasting. Of course, when it comes to spending my own money or especially making recommendations for friends, I want to be fairly certain that a commercially available tweak is worth its salt and will make a genuine, lasting change for the better. The old audiophile adage, trust your ears sounds nice, but our perceptions are easily fooled. Some claim that rigorous double-blind ABX tests are the surest route, but I don’t personally put much stock in them either; aural memories are just not that reliable. So, like a number of other audiophiles and reviewers, my approach is simple but time consuming: introduce a change and live with it for a number of weeks or months–ideally spending some time listening everyday and at different times of the day since mood can affect how I listen. Once I’m fairly comfortable with the sound, I revert the change. After a few more days, if I find that I don’t miss it, the product is probably not worth buying. This brings me to my latest tweak evaluation, iFi Audio’s latest USB signal purifying device: the iPurifier2 that Avatar Acoustics sent me to try out. Before getting into what this thing does, I should explain who it is for; USB audio is a Computer Audiophile thing. (in the tone of Jeff Foxworthy)…You might be a computer audiophile if you have ever argued online that playing FLAC is superior to spinning shiny discs. Or, if you have a PC, Mac, tablet, media player, or network audio adapter connected to an external USB DAC in your main playback system, you probably are one. If you have self-identified as a computer audiophile, feel free to skip to the next paragraph. Computer audiophiles use a computer or computer-like device as a digital transport (similar to the CD transports from a decade or two ago). The transport streams digital music, either bit-perfect or intentionally manipulated, to an attached USB DAC, similar to the external S/PDIF connected DACs from years ago. If you are more familiar with vinyl, the PC acts sort-of like the turntable while the USB DAC is kind-of like the phono stage. A bit of a stretch, but hopefully you get the idea. Why use USB to transfer digital audio? Well, I suppose because it’s there. Early implementations were a mess because the clock used by the DAC came from the PC and was plagued with jitter. Nowadays, virtually all modern USB DACs use an asynchronous protocol to minimize or eliminate the effect of PC transport borne jitter in the audio stream. So, if async DACs are immune to jitter, why not use a standard Belkin USB cable? Hmmm…I suppose you could do that just like you could use lamp cord for speaker wire. If you don’t hear a difference that justifies the incremental spend and you don’t care about having audiophile jewelry in your system, save your money! Thus, if you’re a computer audiophile who has found that purpose-built speaker cables sound better than lamp cord and you are reasonably confident that some USB cables sound better than others, you may be someone who will appreciate the iPurifier2. Others may exit here. Okay. Now that it’s just the two of us, I can start talking about the iPurifier2. Far more details are on the iFi website; however, essentially, in most setups, the iPurifier2 (about the size of a big thumb drive) slips onto the end of the USB cable that you currently have plugged into your DAC. Unlike iFi’s previous generation iPurifier, which as far as I can tell just did passive filtering of the data signal, the iPurifier2 is an active device that re-clocks the signal, electrically balances it, and re-generates it before sending it to the DAC. It also includes some clever technology apparently borrowed from the French military to eliminate the effect of noise on the data signal by generating an inverted noise signal and adding that to the power feed. Sounds reasonable, and the claim is up to a 100x reduction in noise. You can tell that this is an active device because, unlike the original, it runs slightly warm to the touch. Far from hot, it’s more like how warm it would be if you walked around for a while with it in your pocket. My understanding is that it re-clocks the USB data signal–not the digital audio stream that’s encapsulated within the USB data stream. Still, feeding the DAC a nice balanced, clean, and properly clocked USB signal seems like a good idea and should make the job easier for the USB receiver chip in the DAC. 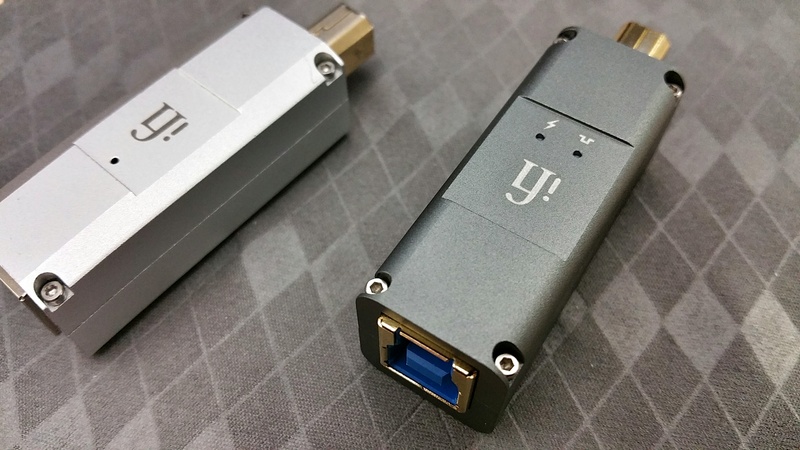 Now, de-encapsulating, buffering and re-clocking (to femtosecond accuracy) the actual digital audio signal before passing it along to the DAC would be some trick and would enable this device to dramatically elevate the performance of older USB DACs. Don’t get too excited, since I don’t think the iPurifier2 (or any USB purifying device that I’ve heard of) goes that far. This does make me wonder about the impact of this device for non-audio USB applications though. For example, can I copy data from my USB v2.0 blu-ray drive faster with one of these attached? Possibly, since cleaning up the signal should eliminate re-transmits–if I’m having any to begin with. Since the iPurifier2 re-generates the signal, I wonder what might happen if I took a dozen 5m USB Type-B cables and plugged them all together with iPurifier2’s between them. I assume there would not be enough bus power to run them all, but ignoring that, would it work? Would the resulting signal be as clean or cleaner than what’s at the end of just one of these cables? I wish I had a USB analyzer, oscilloscope, and the necessary gear to try stuff like this. Back to audio, one thing you may be wondering is if the iFi iPurifier, iPurifier2, and similar products are addressing any real audio problems? I mean, bits are bits, right? I don’t have to worry about USB errors when I save my tax return to a backup drive; that either works or it doesn’t, so why should I have to worry about streaming audio to my DAC? Good question, and I wish I could give you an authoritative answer. I’m just not an expert in this area, so if you are, feel free to comment! What I have discovered is that with fine audio playback, just about everything matters. Mechanical vibrations, radio frequency and electromagnetic interference (RFI and EFI), acoustics, caffeine consumption, if I’m wearing glasses, window treatments, lighting, and even my mood. So, it’s certainly reasonable to expect a device that does all that iFi claims the iPurifier2 does to make an audible improvement in most systems. The folks at iFi announced the original iPurifier back in December, 2013, and if I recall correctly, it was one of the first products of its kind. Since then, Schiit Audio, Audioquest, UpTone Audio, and Wyred 4 Sound, and iFi again have introduced USB purifying devices, joining rather more obscure products from Empirical Audio and Ultra Fi. But while most vendors are content to have just one product in their line to address USB maladies, iFi at present offers no fewer than five devices plus their own split USB cable to separate USB power and data signals. Among the first to market and having by far the greatest breadth and depth in products makes iFi the undisputed market leader in USB purification for consumer audio applications. The fact that there are now at least a dozen products designed to clean up USB signals in one way or another also suggests that the USB purifier is coming of age and should be considered a standard component in any system with a computer audio source. Loudspeakers were the very revealing Legacy Audio FOCUS SE, and headphones were Audio Technica ATH-M50x and Sennheiser HD650. PC transports were Quantum Byte Fanless PC powered by a 12V iFi iPower adapter and running Windows 10, JRiver v21, and Fidelizer Pro and a Macbook Pro running JRiver and roon. When using the iPurifer2 with the iUSBPower, I followed iFi’s recommendation, connecting the iPurifer2 to the input of the iUSBPower rather than the input of the DAC. For comparison, I also had my old first generation iPurifier and UpTone Audio’s USB REGEN which was powered by a bench 5v linear regulated power supply. The effect that the iPurifer2 had on these different systems was consistent. In all cases, backgrounds were darker and stereo imaging was more focused than setups without it. Vocals on the USB REGEN seemed to have slightly more weight in the lower mids, but soundstage lost focus compared to the iPurifeir2. After listening to these systems for several weeks with the iPurifier2 and then removing it for a while, there was no question that I missed what it did for each of them, making the iPurifier2 a bonafide tweak that adds real value–at least in my systems. Needless to say, I requested an invoice instead of a packing slip for the review sample! With my wife assisting, I was able to run an unscientific half-blind comparison between the iPurifier and iPurifier2; and with almost perfect accuracy, she was able to detect which one was in the system. While the difference is subtle, it’s not difficult to tell these devices apart once you know what to listen for. The nano iDSD DAC with Macbook Pro combo seems to benefit most from the iPurifier2; however, even the top-flight Yggdrasil’s performance was noticeably improved, with even greater transient attack and focus. I tried stacking devices but generally did not like the results. For example, the USB REGEN going into the iPurifier2 and then into the iUSBPower sounded a little muddy compared to using either device separately. I suspect the effect is highly system dependent since I have read accounts from others who found combining these devices to be beneficial. This experience has made me curious about iFi’s new iUSB3.0 products which seem to combine USB data signal purification from the iPurifier2 with USB power replacement from the older iUSBPower. Making the most of an iUSB3.0 requires a split USB cable, like iFI’s Gemini (~$200 USD), which brings up the cost of entry from a little over $100 USD for the iPurifer2 to nearly $400 for the nano iUSB3.0 + Gemini combo or $600 for the micro version. Still these are small figures in audiophile terms. My recommendation? Start with the iPurifier2. If you like what it does, upgrade to one of the iUSB3.0 devices later and shift the iPurifier2 to your mobile rig. Taking this path will maximize the value of your system tweak dollars by giving you two fresh new opportunities to discover greater nuance and detail in your music collection.